An 18-month-old toddler is currently being held in San Antonio while the mother is 120 miles away in an immigration detention center. A mother seeking asylum from the Republic of Congo was sent to detention center in San Diego while her daughter was taken to a facility in Chicago. Last month three siblings fleeing gang violence in El Salvador were taken to a shelter in Arizona while their mother was taken to a detention center in Buffalo. This week, the New York Times confirmed that more than 700 children have been separated from their families by ICE at the Southern border since October. While these stories have invoked national headlines, the widespread occurrence has been hidden until now. The policy of separating families at the border was publicly discussed in 2017 by the Trump administration as a deterrence tactic to discourage families from seeking refuge in the United States. Officials from the Department of Homeland Security (DHS) now say they are not splitting families as a deterrence tactic, but rather to protect the best interests of minor children crossing the border. These children and families have faced inconceivable hardships and escaped a life of violence, war, and poverty in their home countries. Alienating them from the only support that they have in the country will only add to the trauma they have experienced. In addition to separating families at the border, the Trump administration is increasing interior enforcement efforts including workplace raids which often result in the loss of a primary caregiver. Earlier this month in Tennessee, a devastating raid took place resulting in 97 arrests. In rural Tennessee this massive raid was a nightmare for families as their mothers, fathers, husbands, and wives were suddenly swept away. Consequently, more than 500 students did not show up to school the next day causing the community to come together to support the families who were impacted by the raids. According to a study by the Urban Institute, for every two adults apprehended, at least one child is negatively affected. Increased isolation and fear of separation creates an environment of toxic stress that manifests in a number of ways in a child’s behavior including problems sleeping, depression, anxiety, and an inability to focus in school due to fear of not seeing their parents after school. According to another report released by the Center for Law and Social Policy (CLASP), even the possibility of separation can cause health problems—such as depression, anxiety, and toxic stress—which can lead to long-term developmental delays that seriously hinder a child’s ability to succeed in adulthood. Immigration policies should be modified to prioritize the unity of families and allow discretion for parents and primary caregivers of minor children. In an effort to combat the stress felt by families who are separated due to immigration enforcement, Representative Roybal-Allard and Representative Torres of California introduced the Help Separated Families Act of 2018 (H.R. 5414). First Focus Campaign for Children has endorsed this legislation. Immigration reform has been a heated topic for years, but the current polarization of our political climate has brought this debate once again to the forefront. 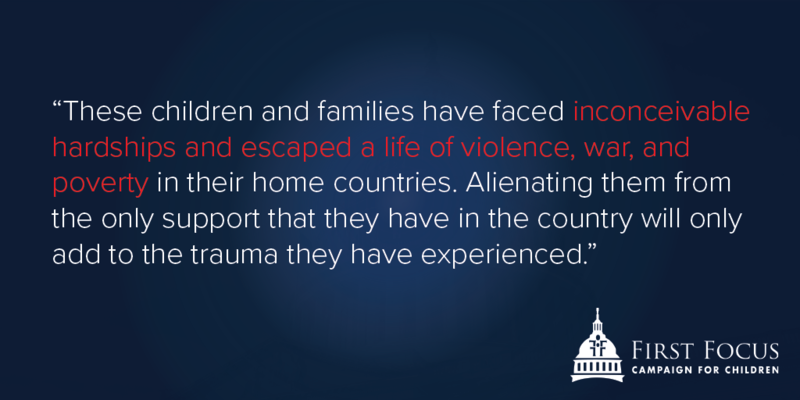 We urge Congress to remember the families involved in these decisions and the children who will be affected for a lifetime due to the trauma of needlessly being separated from their loved ones.